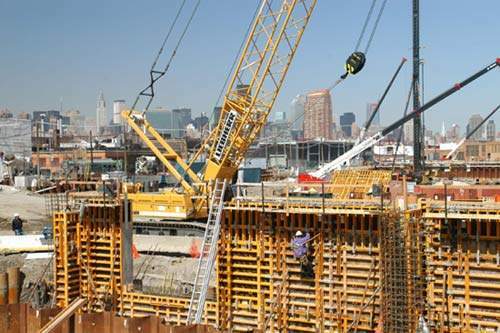 Work began in August 2003 to expand the Newtown Creek wastewater treatment plant's capacity to 1.8 million cubic metres per day. Excavation in the North Battery began in late December and continued despite wet spring weather. Concrete placement began shortly after the excavation was completed. A programme of extensive modifications is underway to the existing plant facilities at Newtown Creek to enable the necessary integration of old and new plant components. A computer image of part of the completed Newton Creek plant. The expansion involves building a series of new grit, aeration and sedimentation tanks and major remodeling of the existing facilities. 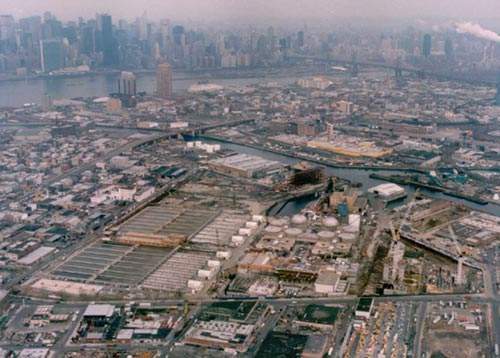 Aerial view of the Newtown Creek plant. Located in the Greenpoint area of Brooklyn, it is the largest wastewater treatment plant in New York. A design model of the finished Newton Creek plant, as it will appear from the water. 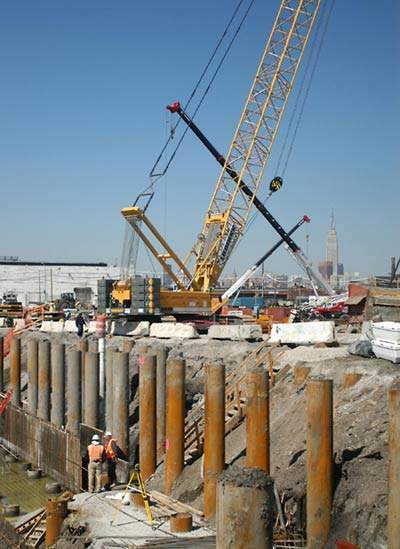 The largest of the 14 wastewater treatment plants in New York City, Newtown Creek underwent a major expansion and upgrade in February 2009 to increase its capacity by 50% and extend secondary treatment to all its inflow. The Newtown Creek plant serves about one million people and covers an area of about 15,000 acres. The plant has a capacity to treat 310mgd (18% of the city’s wastewater) during dry weather. In August 2003, a joint venture of Slattery Skanska, Picone / McCullagh JV and Perini Corp began work on the upgrade, which expanded the plant’s capacity to a daily 1.8 million cubic metres and increased the treatment areas to 24 from 16. The project involved the construction of a series of new grit, aeration and sedimentation tanks, together with the remodeling of the existing aeration and sedimentation facilities. New control and administration buildings are also built along with piers to support air main and odour control piping. Modifications have been made to pre-existing elements and extensive integration of old and new plant components undertaken. This contract, initially valued at $493m, is one of many that have been awarded as part of a massive 13-year programme costing an estimated $2.2bn, to enable Newtown Creek to achieve compliance with the requirements mandated by the federal Clean Water Act. Construction of the plant was completed in February 2009 at an estimated cost of $680m. 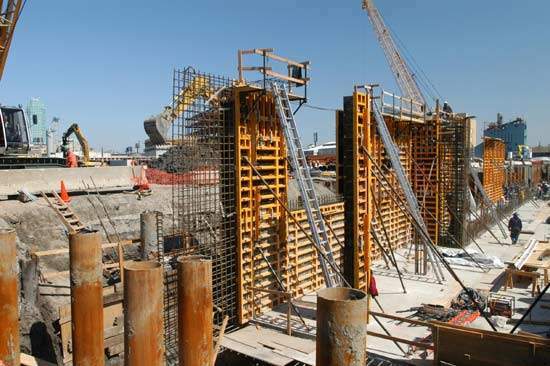 The last elements of the wider upgrade project, which began in 1998, are not expected to be finished before 2013. This will increase the plant’s capacity to 700mgd during wet weather storms. The 53-acre facility will be the last of the city’s treatment plants to be upgraded to meet federal standards. 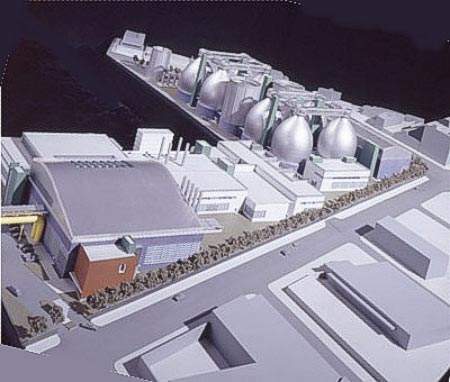 Newtown Creek plant will have a capacity to serve an estimated 1.33 million residents of the drainage area by 2045. Located in the Greenpoint area of Brooklyn, New York, the original plant was built in 1967 and stands on the heavily industrialised shore of the channel separating Greenpoint from Long Island City, Queens. Historically, wastewater treatment has used a high-rate activated sludge process without primary sedimentation, which removes around 65% BOD5 and 75% TSS. 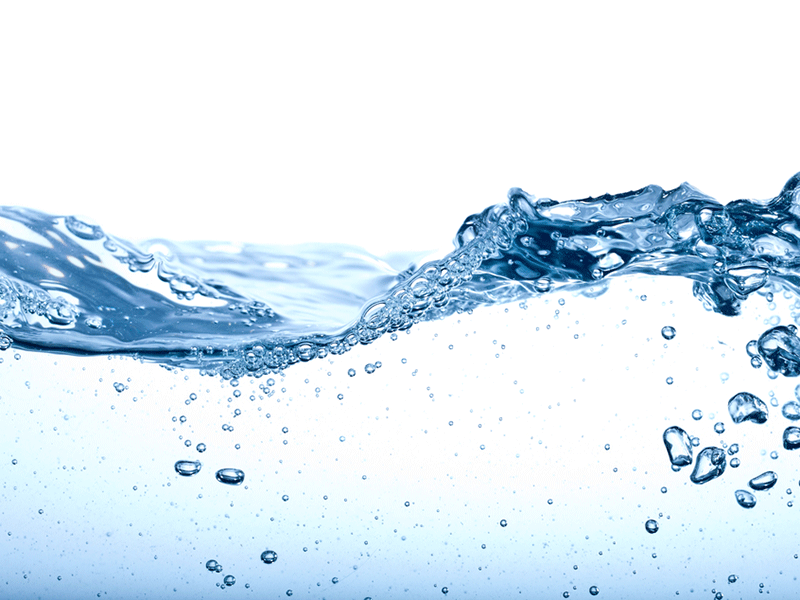 The secondary treatment requirements of the Clean Water Act require 85% removal and a number of options were considered to upgrade the plant to achieve this. One suggestion required demolishing most of the existing facilities, constructing new primary tanks and implementing a new step-feed biological nitrogen removal activated sludge process. A second proposal would have preserved the existing activated sludge process, adding a subsequent biological filtration step to remove the additional TSS, BOD5 and nitrogen. An evaluation study, however, showed that by simply converting the existing aeration tanks to step-feed operation, TSS and BOD removals could be significantly improved. Although it provided no additional nitrogen removal, this course of action, with the addition of extended step-feed aeration / sedimentation capacity, would successfully meet secondary treatment requirements, and at a lower cost than the alternatives. Designed to provide treatment for an annual average flow of 1.2 million cubic metres a day and a peak of 2.6 million cubic metres a day in wet weather, this approach also helps to overcome the major problem posed by a lack of treatment capacity when storm water swells the inflow. It has been estimated that this had previously led to the release of around 30 million m³ per year of raw effluent from sewer overflows. Four aeration tanks and four sedimentation tanks at the Central Battery area of the plant were demolished and rebuilt, while a series of modifications were made to eight aeration and eight sedimentation tanks in the South Battery area. New foundations and support piers are also built at both locations. A new North Battery was constructed, comprising new grit and aeration tanks and associated sedimentation tanks. These tanks extend over an area of around 28,000m³ and required over 60,000m³ of concrete for their construction. In addition, a new influent feed system was installed requiring 30m of encased piping and a 3,600m³ control building built to service the new and modified tanks. Eight new process air blowers were procured and installed in the existing main building and a programme of associated utility work, including an extensive electrical system upgrade, undertaken. The Manhattan Pump Station, which conveys the combined sewage flow from Manhattan to the plant, was also required to be significantly upgraded and enlarged. With a rated capacity of 1.2 million cubic metres a day, this is New York City’s largest wastewater pump station and serves an area of 4,162 acres of land, fed by 180 miles of sewers. The upgrade programme involved increasing the station’s capacity to 1.5 million cubic metres a day and increasing the static lift necessary to match the higher hydraulic profile of the upgraded Newtown Creek plant. This required an associated upgrade of the electrical supply and internal power distribution system, with extensive pipe and valve modifications and the installation of a new odour control system. 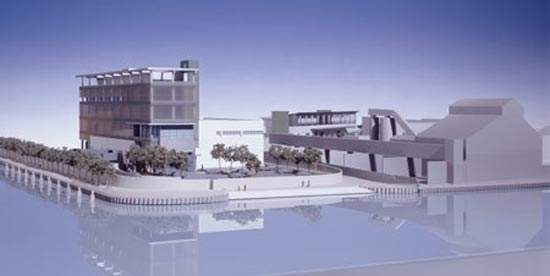 Other works are planned to round off the revamping of the plant, including an education centre, public amenity walk and a variety of specially commissioned artworks have been suggested to augment the site. The architectural design of the plant has been carefully considered to mitigate the impact of the plant within its setting. Some of these design elements have already received Excellence in Design Awards from the New York City Art Commission for their aesthetic appropriateness on City-owned property. New York City Department of Environmental Protection is the project sponsor. The main contractor in the plant expansion programme is a joint venture of Skanska USA Civil Picone / McCullagh JV and Perini Corp, with ownership in the ratio 45:30:25, respectively. The individual Skanska companies involved are Slattery Skanska, Gottlieb Skanska and Underpinning & Foundation Skanska. Hazen and Sawyer led the project planning and design team, which included Greeley & Hansen and Malcolm Pirnie. The Polshek Partnership was the architect for the disinfection and administration buildings. The lighting design for the egg-shaped reflective steel bulbs, which digest the sludge, were designed by L’Observatoire International who won an award from Architecture Lighting magazine. The environmental impact studies were performed by AKRF. Sanitaire supply the aeration equipment and Bird Machine Company supply centrifuges.